These are polarized and polarizing times. The news these last few weeks has drawn us in while repelling us at the same time. I don’t know whether I need to pay more attention to the news cycle or pull away from it entirely. The wise course is probably somewhere in between. We do, both as people who live in this country and as people of God, need to know what is going on around us. We cannot casually turn away and refuse to see the trials of our fellow humans especially when those trials are rooted in gender and race and economic circumstance like they were in the Apostle Paul’s time. At the same time we cannot let ourselves be so focused into one news item or ideology that we lose sight of everything else going on or fall into despair. Paul wrote this message of equality and respect in the present indicative* 1,970 years ago or so. Let us live in a way that it is so today. Let’s take a prayerful moment of reflection to demystify the terminology of “spirituality”. What does it take to be a “spiritual” person? Clairvoyance? Visions? Vivid precognitive dreams? Such things might indeed be spiritual experiences, but our tradition has something more tangible in mind when explaining what spiritual life is all about. It turns out that Christian spirituality is a very practical discipline. The pastoral letter to the Galatians describes ripples of actions that emanate from ones spiritual being- “… the fruit of the Spirit is love, joy, peace, patience, kindness, generosity, faithfulness, gentleness, and self-control…” (Galatians 5:22 & 23). Practicing such ways of being (love, joy, peace, etc.) also feed our spirit- think of practicing the qualities listed in Galatians 5:22-23 as a sort reverse engineering of growing spiritually in our everyday practice of faith. May your day and remaining week be spiritually meaningful, and I hope to see you on Sunday. The little girl at the Dollar Store might have been on spring break or she might not have even been old enough to go to school. Either way she charmed us all by modeling her new Easter hat, the lilac straw with the wide brim highlighting her black shimmering hair. We smiled at her as she twirled around with her hat on before her mother took it from her to have the cashier ring it up. The girl was thrilled. Come Sunday she would be one of the best dressed folks at church, no doubt. The whole world ready for Easter, but few takers ready for the sorrow of Holy Week, which starts with Maundy Thursday. 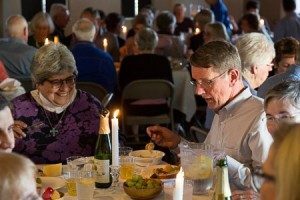 We will gather in the parish hall, eating and laughing, enjoying ourselves until we remember why we gathered, why the disciples gathered with Jesus centuries ago. It’s a hard story of betrayal and faith, of hope and despair, and questions that have survived the centuries. Why did it have to end in a crucifixion? What was the meaning of it all? The death and the Resurrection. What does it tell us about God? Not that long ago Patty Ebner and the Rev. Melanie Weiner and I stopped at cells and asked men who wondered about Ash Wednesday if they wanted to be marked with the cross reminding them of their mortality. “Dust thou art and to dust thou shall return,” I heard myself say again and again. Lent began, the slow march to Holy Week and the victory of Easter. Men bent to receive the ashes. Some foreheads were wet with sweat because the men had been working out. Some foreheads were smooth and easy to mark with ash, while other foreheads were furrowed, signifying a worried man. The men understood mortality. We all do. The world will end someday for each of us, but the promise of Easter is that we as Christians will see the risen Lord, will celebrate his return and in breaking bread with one another hold out the hope that the Christ will rise again. This Easter, may we be like that little girl: offering the world our best, knowing that our faith will lead us to the light, our eyes will shine with the knowledge of God’s love, and the joy of the day will remind that we are God’s children, the Body of Christ. This psalm once made me nervous. I didn’t necessarily want anyone to know me so well and to always be watching me I mean it’s kind of like Santa Claus, right? “You better watch out; you better not cry…” But as I have grown in faith, and now even when I grow in doubt, this has come to be one of my go-to passages for connection, for comfort, even for challenge. Psalm 139 is a love song, a song of unconditional love, the kind of love that we humans strive to be and hunger to feel. God knows me, everything about me, and still loves me, not despite the fullness of who I am, but because of the fullness of who I am, who I am with every gift and every flaw. This is active love. God not only desires to be in relationship with each of us, but is willing to pursue us. We can run, but we cannot hide. This may feel frightening — I know it once was for me — but it also feels wonderful. God is not satisfied with sitting back and watching God’s children work and play and grow. God chases us down for the purpose of working and playing and growing with us. May we love others and ourselves with the same passion that God loves us. Our children are learning about the life of Jesus with a series of beautiful paintings. Last Sunday, one child asked, “Why would God send Jesus just to die? This is a question that makes many ministers quake in our boots. When my daughter asked it of our UCC minister, the Episcopal priest who was attending worship that day comically expressed relief that the UCC minister had to answer her. I don’t remember Pastor Julianne’s answer, but I will never forget the question. It’s a question without answers that will satisfy a 10 year old. So let’s think about the presence of Jesus in another way. Thank God for children who ask the questions we all wonder about. With Ash Wednesday, Lent has arrived. Lent is a season of reflection and preparation, a time to step back and examine our lives. Jesus spent 40 days in the wilderness reflecting on what is truly important before he began his ministry in earnest. So we too have the opportunity each year to take stock of what is truly important today. Traditionally people observe Lent by giving something up. One might choose to give up something that is enjoyable, like chocolate or soda. Or perhaps one might choose to give up a habit that they hope to break. Perhaps I have told you about the year I gave up yelling at my children… Lately I have chosen to take on a discipline during Lent. I find that this fills my spirit and gives me the opportunity to learn a new healthy habit (when I am successful) and practice self-forgiveness (when I miss a day or two or seven). This year I have committed to write every day, primarily using 642 Tiny Things to Write About as my inspiration. At the end of Jesus’ time in the wilderness, he was hungry. When we have completed our observation of Lent, may we too be hungry, not only for chocolate or soda or what we have given up but also for Easter, for resurrection, for Jesus to live again. One down. Thirty-nine to go. Yesterday was a day of rainbows. As I drove to church, there was a rainbow spanning the freeway. When I went out for a short walk in the sunshine, there was rain in the distance and a rainbow lighting up the sky. As I drove home and came into view of the Santa Clara Valley, there was a double rainbow all the way across the sky. We have been enduring a severe drought for more than five years. Summers have been warm and dry as usual, and winters have come and gone with little rain and less snow. Our reservoirs sank to new lows, and our green fields became brown and crispy. But now water is falling from the sky! Glorious rain has filled the streams and reservoirs, and snow gathers in the alpine meadows. There has been flooding and traffic has been snarled, but think of all the cool water we will have to fill our glasses and water our plants when summer comes back around. After the flood destroyed the earth, when the rain finally stopped and the waters receded and Noah and his family stepped down off of the ark, God made a sacred agreement with the earth never to wreak such destruction again. As a sign of that covenant, God placed the rainbow in the sky. Whenever I see a rainbow, I take the time to remember that I am never without God, that God promises to always be present. Even when drought threatens our food and water supply or flooding washes away property, God is with us. This is God’s promise to each of us, written across the sky. We have just celebrated Valentine’s Day, and love is in the air. This Bible passage is often read or sung at weddings, but it is not actually about romantic love. The Apostle Paul writes to us about agape, the full and unconditional love that flows from God to us and with which we are called to love each other. There is more to being church than a group of like-minded individuals coming together on Sunday to worship. We also support one another in times of joy and times of grief, minister together to our community, enjoy fellowship, learn, and much, much more. These all come down to loving one another. And if we love one another, if we share agape, with all of the characteristics Paul lists, we need not even be like-minded in all things. In fact, if we love one another we may even vehemently disagree about any number of things. Because when it comes down to it, what we disagree on does not define who we are as a group. It is our shared commitment to worship, service, faith formation, fellowship, and most of all love that binds us together. So let us choose love. I waited patiently for the Lord; [who] inclined to me and heard my cry. As I was digging through the files of my career, I was making the hard choices of what to keep and what to throw out, when in the midst of the paper there surfaced little gems I had not seen in a long time. One of these was a song I wrote based on Psalm 40. Psalms were meant to be sung. In their earliest form they were chants by the priests in the temple. Though it is hard to discern their rhythm in our English translations, these psalms were often clever play on words, or parallel phrases, and repeated choruses. Many of them were meant to be sung by an antiphonal choir passing phrases back and forth between the singers. Every age has spent time reinterpreting the Psalms to meet their spiritual need. While plain chant served the monastic movement, the Reformation saw a surge in hymn writing based on the Psalms. 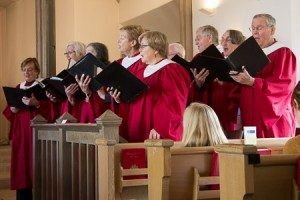 These were songs to be sung by the congregation such as the Scottish Psalter, or the hymns of Martin Luther. As a spiritual practice I started to rethink the Psalms for my own use, and since I grew up in the “folk music” era, I interpreted them to be accompanied with simple guitar chords. Last Sunday we sang one of my interpretations of Psalm 40. If you would like to hear it, you can go to our website – foothills-church.org – and listen to the congregation sing the chorus while I sing the verses. I hope this will encourage you to read the Psalms in a new way, not just as a form of oral recitation, but as a way of provoking you to sing a new song in praise of God. There’s no gift worthy of you. I will sing a glad song to the Lord. I will not restrain the joy in my heart. Let’s Talk: About a New Year’s Resolution? A colleague sent me a copy of a December 29 New York Times article entitled, “The Pitfalls of Trying to Read a Co-Worker’s Mind.” He commented in his email that not only is it a great article about relationships with people with disabilities but it is an important statement about ALL relationships. I agree. As I read the article I thought about how often I just don’t get it. I think I know what another person is thinking or feeling or experiencing. I base my reaction on what I think I know rather than what the reality is. Often what I think I know is more about what my experience has been and what my reality is and has little to do with the other person’s experience or reality. And, that is when I make mistakes and I make assumptions and I risk hurting or offending the other person by my reaction or response. And, yet, the way to avoid this kind of pitfall is so simple. Ask. Ask questions or even just ask one simple question: “What is it that you need?” or “How can I be most helpful?” or “This is what I see? Is this what you see?” Sometimes those questions can be hard to ask because we are afraid of the answers, especially when it comes to the last question. We are afraid that someone is going to tell us the truth-that our behavior was offensive or that it hurts them when we say or do something in a particular way. It takes courage to be able to tell another person how we perceive their actions or how their behavior affects us. It also takes courage to ask the question in the first place, knowing the answer may not be what we want to hear. But, the reality is that none of this is possible without first building relationships of trust. We need to listen to our co-workers or friends or colleagues, even family members who we think we know well, and take time to learn about them and what is important to them. We need to show interest in their lives and a willingness to understand how they perceive the world around them. Once we do that, trust begins to form. Relationships grow stronger and when someone assumes that your stepping in to make coffee is a sign that you think the person is not capable of making their own coffee, that person will have the courage to ask you about it. And you will trust that person enough to explain what you were thinking. And, once we can have those conversations at the coffee machine, just imagine the kinds of conversations we can have about privilege and prejudice and gun violence and poverty. There is no end to the work we can do together when we first trust one another enough to learn how to talk to one another. I hope that you will also commit yourself to building those relationships in your own communities this coming year and then engaging in these important conversations. I hesitate to call it a New Year’s Resolution because New Year’s Resolutions have such a bad reputation for being broken so I will say, instead, that my prayer for 2017 is that our Conference also begin some focused work on building these relationships and beginning these tough conversations. The conversations will make us stronger and as a strong community of faith there is no end to the good that we can offer the world.